This is the first time I am buying a property (executive condominium) and there were number of things that caught me off guard. If this is your first time too or you are doing research for your first one, I have steps and facts here to help you make a better decision. I talk a lot about cost because very few sites gives you the total cost of ownership. Knowing the total cost determines your ability to afford an apartment. This post is first of a three part series: see part 2 on taking up a bank loan and choosing between one and part 3 on Guide to Buying an EC: Settling the Legal Matters. The important numbers you need to know before comparing the prices of the property is the sale price and the floor area. From these two numbers, you can derive the psf (price per square feet). It is easier for your mind to work with this unit of measurement. Usually the developer or agent will give you the floor area in sqm (square meter) which you can convert to sqft (square feet). To give you an example, if the price of the unit is $900,000 and the floor area is 100sqm. The psf will be $900,000 / (100 * 10.7639) = $836. For every square feet, you are paying $836. Now that you have the psf number, it is time to put the number into perspective. One way is to check the caveats lodged with the URA or HDB (resale flats). Caveat is a legal document that is filed and it contains the price and date of the property transaction. By going through the past caveats, you can get an idea of how much you should be paying for. From what I observed, the psf has inched upwards in the last two years. Comparing two units whose floor area is within range of each other in Pasir Ris: an 18-year 4-room HDB resale is about 450K and 3 bedroom EC is about 900K. The psf for EC is at $800 is pricey. This figure is unthinkable two years ago and the price of private condominium has pushed upwards too. This places a great amount of stress on the middle-class family who has a combined income of $10K. They can only look at resale flats and EC. When buying a resale flat near their parents, they are not eligible for the stay-near-parents grant. Resale is not cheap either after you factor in the age and condition of the flat and renovation works. 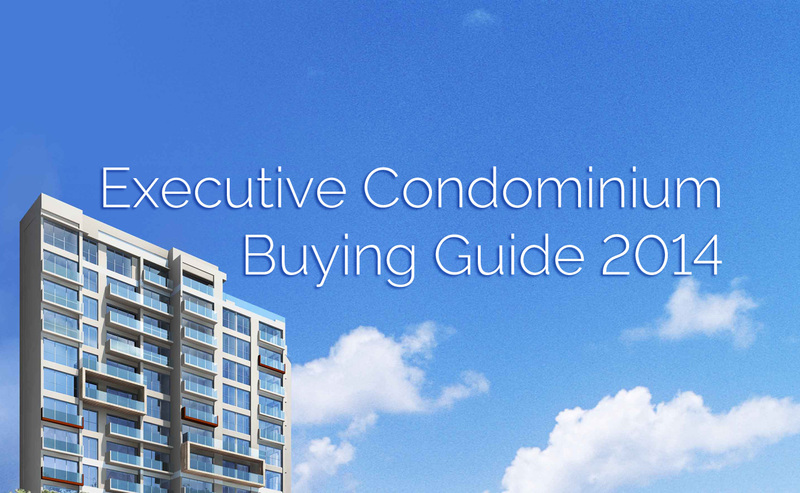 There is an incoming ceiling for buying an executive condominium. If you gross monthly income together with your partner exceeds $12K, you are not allowed to buy. HDB will check your payslip for the last three months to verify your qualification. You are qualified for grants when buying an EC. For gross income below 10K, you get 30K. From 10 to 11k, it is 20K. And the last tier grant is 10K. You can see the official page from HDB here. Grants are touchy topic here where many are arguing that if a family can afford an EC, they should not be subsidised. Hence, it is likely this grant will be remove in the near future. Also, when you sell your flat, this housing grant will return to your CPF account. 5% of the property needs to be in cash which is also the booking fee. The remaining 15% of the down-payment can be paid using all of your CPF with the left over in cash. The bank can loan you up to 80% of the sale price of the house. If you are buying a $900K property, you can loan up to $720K. If you and your partner have a combined CPF of $100K, you can use all of them. You will need to pay the remaining $80K in cash. The bank also have to assess your loan serviceability before it can loan you. This is based on the Mortgage Servicing Framework (MSR) set out by the MAS. The maximum loan you can take is 30% of the combined gross monthly income set at 3.5% interest rate for a maximum of 30 years. The new rulings from MAS has made it difficult for buyers to buy expensive property. This leads to an interesting problem. The income ceiling for an EC is set at $12K monthly so the maximum loan you can take based on this mortgage affordability calculator is $801,702. If you are aiming for that $1.2 million EC, you need to have deep pockets and have lots of cash spilling out it. Actually, you do need a lot because I have not covered the extra cost and charges yet. Do you have $20K of spare change dropped behind your sofa? If not, you better start raising that amount. Buying a house requires you pay stamp duty. Buyer Stamp Duty: first 180K taxed at 1%, next 180K at 2%, thereafter at 3%. So the first $360K of your house is $5,400. If you are buying a $500K house, the total stamp duty is $9,600. Aiming that $900K EC? That is $21,600. You see how quickly the stamp duty increases? Apart from stamp duty, there is the legal cost of hiring a solicitor which starts at $2500. A valuation report that the bank needs is about $214. If you are maxing out your loan and doing complete draw-down of your CPF's ordinary account, remember to include the stamp duty and legal cost in the cash amount you have to prepare. Once you move into the house, you will start paying property tax and fire insurance. Fire insurance which is about $100 annually. Property tax is progressive - the more expensive your property, the more you buy. The tax rate if you staying in the property is significantly lower compared to renting it out. The official page from IRAS showing how tax is computed. The annual value of your property is estimated rental amount that you will get if you rent it out on the market. For example, if the market rent of your house is $3000 a month, it works out to an annual value of $36,000. The property tax for that annual value is $1,120. This is very simple to do and I highly recommend you spend five minutes doing this check. You don't want to be a victim of a scam. Generally, you want to choose a property that is near to a supermarket and transport stop (bus or MRT). Other considerations are proximity to parents, school, workplace and recreation. The property agent will say all the nice things about the place and it is their job to give you a sale pitch. It's all about presenting the bad things in a good light and the good things as strength. You can also engage in interesting speculations as to where the new MRT station will be. Starting with the north-east line, all MRT lines are now built underground. The line tend to follow the major road because it is safer than tunnelling under a block of flats and there is less land to acquire. Once, you have a rough idea on where the line will be, you can start looking at small plots of empty land (field, forest, parks) that can be converted into a station opening. Just remember that this is all speculation and you should not make your decision purely on speculation. Now, on to choosing a unit. 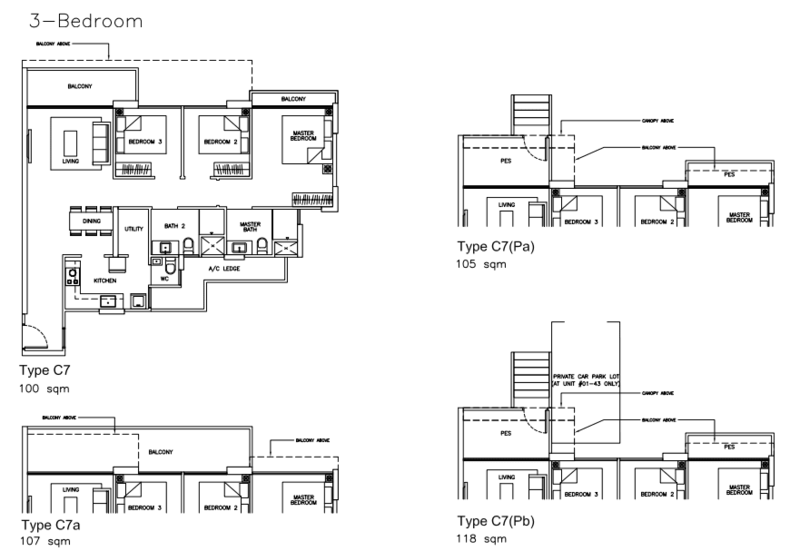 In terms of the floor area of the unit, EC comes in 2, 3, 4 and 5 bedrooms. This label is different from the HDB 4-room units which atually means 1 living room and 3 bedrooms. A 3-bedrooms in an EC means 1 master bedroom and 2 smaller bedrooms. The master bedroom has it own toilet. The trend now with an apartment now is having 3 toilets. Apart from the master bedroom's toilet and the common toilet for the two bedrooms, there is a third one located in the kitchen. This third toilet is much smaller and my guess is that it is for the maid. The maid is probably going to sleep in the utility room in the kitchen. It does not seem like very nice treatment but with living so expensive in Singapore, it's the best a family can do. Base unit at the top left, the others are variants of it. There are different floor plans you can choose from. You can go through the different layouts in developer brochure or search for them online. Many property agent will buy a domain name and put up these information online to get sales leads. The height of the unit is an important consideration as the higher floor sells for higher. I was quoted $10K more for each level higher and if I were to extrapolate from this information: the difference between a 2nd floor and a 10th floor will be $80K. This is easily more than a person's annual income and not an amount to be sneezed at. The EC show flat will have a scaled model of the entire development. If you want to find more about the EC, looking at the model is the best way to analyse. I imagine myself walking through the model and thinking about my daily tasks. What is the path through the building that I will take to get to work? If I am standing at this unit's window, what will I be seeing? Which direction will the sun be shining at the afternoon? Which rooms and walls will have direct sunlight? If there is a road, will there be heavy flow of traffic? If it is near the tennis court, how noisy will it be? EC comes with furnishing which usually includes the floor tile, the kitchen cabinets, stove, basins, electric oven, toilet furnishings and built-in wardrobe. The windows are almost floor to ceiling in all the new houses because it cheaper to install glass than build a concrete wall. Once you get the keys, you only need to install the lights and move in your furniture. The unit that I bought did not have a yard. Where does one dry his wet laundry? 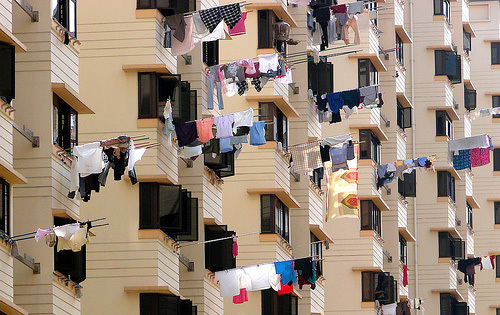 Staying in a HDB, I am used to the hanging of wet clothes on bamboo poles out of the kitchen window or in the kitchen. To me, a dryer is wasteful when you have the luxury of a tropical weather to toast your clothes. If you have a balcony, you can hang your wet laundry on a clothes rack and air them there. There are two ways the car park can be built: multi-storey or underground. Underground car park is a better choice for these reasons: you can park nearer to your block, have full shelter to your house and it is faster than going in circles in a multi-storey car park when you get home late. Staying in an EC means having facilities such as swimming pool, gym, BBQ pits and a personal parking slot. You also have a security team that protects you from the mostly harmless public (nothing can stop determined person from infiltrating the ground). All these comes with a price: a monthly maintenance fee of $300 to $400 a month. An option is a contract that give the owner the right, but not the obligation, to buy or sell the underlying asset. Buying the option gives you the Option To Purchase (OTP) the EC. The OTP (also known as the booking fee mentioned earlier) is set at 5% of the sale price of the unit. The rights of this option is not transferable - you cannot sell the option to someone else in an open market. When you get the Sales and Purchasing agreement in your mailbox, you have 3 weeks to decide if you want to exercise the option. If you choose not to exercise the rights to your option, you will lose 25% of the OTP. If the unit is 900K, the OTP will be $45,000. If you choose not to exercise, you will lose $11,250. If HDB rejects your application for the EC for failing to meet the restrictions, you will get full refund of the OTP. URA has the rules of the OTP written in black and white here. If the couple decides to cancel after the signing the Sales and Purchasing agreement, they will forfeit 5% of the price. You get a choice of making a progressive payment or deferred payment. Progressive payment is the scheduled payment to the developer depending on the progress of development. The full schedule of payments is listed at URA page. By the completion of the ceiling of your unit, you will have paid 50% of the price. When you are given Temporary Occupation Permit (TOP), 85% of the payment is made. The remaining 15% will be paid on year from TOP. Deferred payment scheme lets you put the 20% downpayment and then only pay after you are given notice of vacant possession (anywhere from 2 to 3 years of booking). I was told by my agent that the sale price will be higher if you go with the deferred payment option. Most of the EC will have a Facebook group created by owners and enthusiasts. Join the group to discuss about floor plan, banks loans and get renovation ideas. If you have a question, the group may already have the answers. They also constantly track the progress of the project with photos of the construction site and even updates on the number of units left. The price of the house is the number one limiting factor. Beyond the sale price of the house, there are miscellaneous fees that you have take into consideration. This post is first of a three part series: see part 2 on taking up a bank loan and choosing between one and part 3 on Guide to Buying an EC: Settling the Legal Matters.